As everyone who has sold a house knows, real estate commissions are a rip-off. Real estate agents charge a commission for their services so it doesn’t matter what value the house is or how easy it is to sell, they get their 5% (approximately). To counter this fee, the for-sale-by-owner movement has been gathering momentum. Larry MacDonald wrote some interesting posts on his successful efforts to sell his house and CNN had a post about an innovative strategy to not only sell your house without an agent, but sell it in five days. If you are going to sell your house on your own to save money, don’t expect to save the entire amount that would have gone to an agent. You still have to spend money on marketing and that marketing budget should include some professional signs. I don’t know how many times I’ve seen FSBO signs that looked like they were made by three year olds. I was in fact inspired to write this post by a FSBO house on a nearby street which had quite possibly the worst signs I’ve ever seen. Your typical kid’s “Lemonade 5 cents” sign would put these FSBO signs to shame. Unfortunately by the time I went to take a photo they had taken their open house sign off the porch and I couldn’t get a good picture of the sign in the window. But to describe – in the window they had a piece of cardboard (normal box colour) with ripped edges – that’s right – no time to cut properly, gotta sell that house! Written with black marker in letters too small to see from the street, was presumably the details of the house sale – I could only read the “For Sale” portion of the sign. Attached to their front porch was an “Open House” sign – this was made out of very unevenly ripped cardboard (they must have been quite angry at this point), written in marker, possibly with the hand of a seven year old and had the news that they were having an open house on Sunday, 2-5 pm. The thing that amazes me the most is that this house is probably selling for around $400,000, so we’re not talking about an abandoned grow house. How on earth could that homeowner possibly expect that a reasonable buyer is going to enter into a legal transaction worth $400k with a owner that looks like they went out of their way to have the most unprofessional signs possible? The signs cracked me up when I saw them. 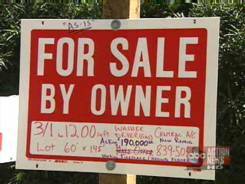 The sad thing is that it seems like 90% of the FSBO houses I’ve ever seen have horrible signs – it’s not just a few bad apples. That’s sooooo ghetto!!! Why would people not want to put their best foot forward? I’m glad you noticed and I’m going to keep that in mind when I go to sell my house! Brooke – “ghetto” is exactly the right word. Emily – lol – is he a golf pro by chance? Mike, i would bet he’s never played golf in his life. he’s…oh i don’t know how to say it nicely. undereducated i suppose would work. oh did i not mention he wrote that UNDER the sign’s preprinted “For Sale”? He can’t even spell it right when it’s written above correctly. Emily – that is too funny. Comfree is a fairly big venture out here (they’re in a few canadian markets). You pay 700$ and they take the pics, write up the brochure, give signs, and put it on a searchable website. It’s big enough here in Edmonton that most people will search the comfree website as well as the MLS website. But with the glut of housing right now, it’s become more of a place where people pay the $700 to see if someone will bite at their grossly inflated price. And if not, so be it. Nobleea – thanks for the info. I have sucessfully FISBOed a house and we did have to spend some to do it on ads and a decent sign/flyers. But my number one advice is to clean it up really well and dress professionally during the open house. Our house sold for asking price which was what the agent would have listed it for and it took less than a month. Katmaxx: So you ended up 5% of the value of your house ahead (or whatever the going commission is in your area). Pretty sweet payment for a month’s work! Good for you!!! Funny sign. People think the house will sell itself I guess. A little money spent on curb appeal and a decent sign would go a long ways. Interestingly enough I just walked by that house and they have listed with an agent. I couldn’t find it in mls though (I’d like to see what they are asking).